The Model 8000SP1G2 from AR is a self-contained, forced-air-cooled, broadband solid-state amplifier that operates over the 1 to 2 GHz frequency range, and is designed pulse applications at low duty factors where instantaneous bandwidth and high gain are required. The low level of spurious signals and linearity of this device makes the 8000SP1G2 ideal for test and measurement, (including EMC RF pulse susceptibility testing), industrial and university research and development, and service applications. The 8000SP1G2 amplifier will provide a conservative 8000 Watts of RF power when used with a sweep generator. 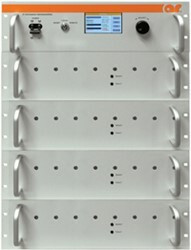 The amplifier's front panel digital display shows forward and reflected average power output or forward and reflected peak power, plus extensive system status information accessed through a series of menus via soft keys. Features include a built-in IEEE-488 (GPIB) interface, 0dBm input, TTL Gating, VSWR protection, gain control, RF output sample ports, plus monitoring of baseplate temperature and cabinet temperature. Download the datasheet for more features, specifications, and configurations of the Model 8000SP1G2.